The following is a list of the major league baseball teams or franchises that have won the most number of World Series Championships thru the 2018 season. Every team that has won at least six World Series Championships is listed. This list is dominated by one team - the New York Yankees - and one player - Babe Ruth. The Yankees have by far won the most championships, while Babe Ruth played a big part in both the Yankees and the Boston Red Sox being on this list. 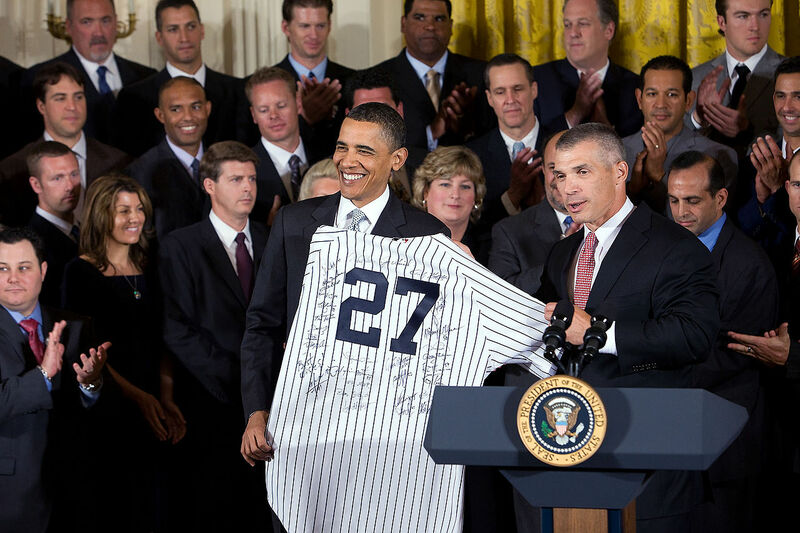 The New York Yankees have often dominated baseball and have won the World Series an incredible 27 times. The Yankees won their first World Series Championship in 1923, with Babe Ruth leading the way, and their last championship in 2009, with Derek Jeter as the Captain. Since 1923 the New York Yankees have won the World Series 30% of the time it has been played, 27 out of 89 years (the World Series was not played in 1994 due to the players strike). Overall, The New York Yankees have appeared in 40 World Series, and have a record of 27-13. With 11 World Series Championships the St. Louis Cardinals are the second most successful franchise in baseball history. The Cardinals last won the World Series in 2011 when they beat the Texas Rangers and sent manager Tony La Russa off to a happy retirement. The Cardinals have appeared in 19 World Series and have a record of 11-8. The A's won five World Series when they were based in Philadelphia, including back-to-back titles in 1929-1930 behind Lefty Grove who went 48-11 (.814) during the those two years while the A's went 206-98 (.678). The A's didn't win again for 42 years until 1972 when they were in Oakland, and then the team won three straight behind Reggie Jackson and Catfish Hunter. The Oakland A's won their last World Series in 1989 with Mark McGwire on the team. McGwire has admitted steroid use but it's unclear if he was using steroids in 1989, though teammate Jose Canseco admittedly was. Overall, the A's franchise has made the World Series 14 times and has a record of 9-5. The Boston Red Sox have had a wild World Series history. The Red Sox won the very first World Series in 1903 and then won four more World Series including the 1915, 1916 and 1918 series with Babe Ruth pitching them to the titles, and then went 86 years without another win. Even with Ted Williams they only managed to make it to the World Series once, which they lost, and then with Roger Clemens leading them the Red Sox lost the 1986 World Series on Bill Buckner's error. But the Boston Red Sox finally ended the drought in 2004 and then came back to win three more World Series titles in 2007 and 2013 and 2018. Overall, the Boston Red Sox have made the World Series 13 times and have a record of 9-4. The San Francisco Giants won five World Series when they were the New York Giants (1905, 1921, 1922, 1933, 1954), and have won t​hree​ more since moving to San Francisco (2010, 2012, 2014). The Giants franchise has appeared in 20 World Series, so the team is only 8-12 in World Series play. As the Brooklyn Dodgers this team appeared in nine World Series and managed to win a championship in 1955. Most of the time the Brooklyn Dodgers met and lost to the New York Yankees in those World Series. After moving from Brooklyn to Los Angeles, the Dodgers won five World Series while appearing in nine more fall classics. Altogether the Dodgers have appeared in 20 World Series and have a combined record of 6-14. The last time the Los Angeles Dodgers won the World Series was in 1988 when Kirk Gibson hit a dramatic walk-off game winning home run off Oakland A's Hall of Fame pitcher Dennis Eckersley to win Game 1 of the series. As MLB takes an All-Star-break breather, a clear crop of World Series contenders has surfaced above a crowd of playoff candidates.